When you’re looking for durable and long-lasting doors and frames, stainless steel is the obvious choice. Stainless steel is one of the toughest materials around, and it’s practically maintenance free. 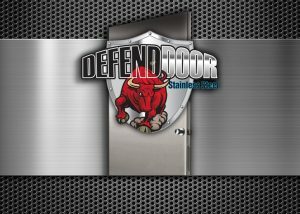 DefendDoor products are built to last – All doors are internally reinforced with continuous 16 gauge stainless steel rails which span the entire height of the door on both the hinge and lock stiles, and across the top and the bottom. Stainless steel resists oxidation and rust, and occasionally wiping them down with water is all that you’ll have to do to maintain their factory-fresh appearance. Most importantly, you can count on every DefendDoor product to give years of dependable service, often outlasting the building in which it’s installed. DefendDoor products are custom built – All doors are custom-built to your specifications. We can build the doors in sizes up to 4′ 10 1/4″ wide and 12’0” high in either 304 or 316 #4 finish, and frames up to 10’0” wide and 12’0” high. You can pick from polystyrene, honeycomb, or vertically stiffened steel cores. For fire safety applications DefendDoor products are available in sizes up to 4’x 8′ single doors and 8’x 8′ double doors with 20 minute, 45 minute, 90 minute, and three hour Warnock-Hersey fire door labeling. DefendDoor products are shipped when you need them – Our standard turnaround time on DefendDoor products, Quik Ship service, is two weeks for frames and three weeks for doors. If you need them sooner, we offer expedited shipping options, such as Hot Rush service, in which we ship doors in five business days and frames in three business days. If you need your order faster than fast, ask for Walk Thru service, and we can ship stainless door frames as early as the next business day and stainless doors in 3 days. When you need flexibility from your supplier, large or custom sized doors, or the most dependable and durable doors and door frames available, call NCHM at (800) 334-3070 or contact us online at this link to get started. At NCHM, if you can dream it, we can craft it.